This year John and I had time off from work at the holidays (December 22nd - Jan 3rd). Usually we like to go on an epic roadtrip but, with the new addition to the family, we decided it would be in our best interest to stay home. The Saturday before our vacation began (December 18th), John and I took a walk down to the local burger joint, and over lunch I asked what he wanted to do with our vacation time. He informed me he was thinking about re-tiling the kitchen. I explained, slightly panicked, that if we were going to do that we needed to pick out tile immediately, as availablity could be an issue. And so after lunch, it began. We spent a couple hours on the floor of our local Lowes playing with different configurations. Before the weekend was out we priced sinks, refrigerators, and got a general tile design and layout figured through a combination of visits to Home Depot, JC Tile, Sears and Lowes at least once more. We read through our home tiling books, asked store employees and friends for advice, and borrowed a tile saw. All that was left to do was to do it! 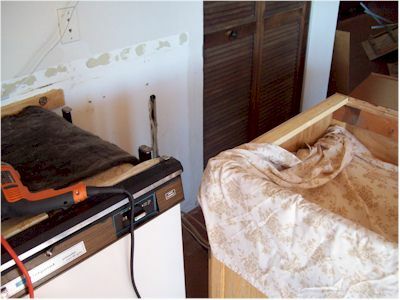 It is amazing what you will learn about your home and its previous owners when you remodel. Tuesday night (12/21) we began the demolition process, anticipating the removal of the tile could be a lengthy process of hammering and prying. Nope. We quickly discovered the only thing holding the tile down was the microwave and gravity. The entire demolition process went very easily. Only two tiles gave us work, and even then, not much. A couple quick smacks with the hammer and they too were gone. Wednesday (12/22) we went shopping. We purchased the sink, bought a new faucet fixture (that was too tall and ended up getting exchanged), ordered the refrigerator (scheduled to be delivered Friday 12/31) and ran to multiple locations for proper tile quantities, lumber, tools and supplies. We layed out the tile to review the work ahead. 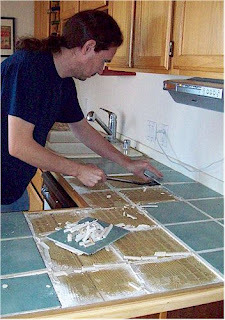 Thursday (12/23) we went to the last tile store to pick up the backsplash, grout and caulk. There was a brief panic when we discovered that there was an error in the store's inventory and the tile we had selected was in short supply and the store was closing for the holiday in 15 minutes. John and I grabbed 6 new samples with ample stock, raced home, flashed through each tile, and returned in 10 minutes with our new selection. I think in the end we both liked the substitute tile better than what we had originally picked out. We spent the rest of the day removing the plywood base. It was far more securely attached than the tile - actually screwed down. It was work enough that I let John unwrap a Christmas gift early - a brandy new heavy duty power driver rugged enough for anything! 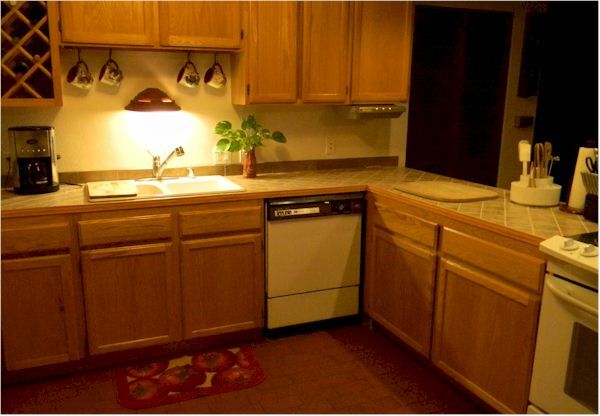 Friday (12/24) it occured to us, with the counters off, that we could add a cabinet in the empty space by our pantry. A quick internet search followed by a trip down to the Home Depot and we were installing a new unit. I convinced John to do a little electrical work to remove a junction box and two auxillary outlet boxes that were wedged in our bar among our plastic storage-ware for no particular reason. There was an arching incident at one point, that we are both grateful will never happen again. We worked on building the new counter base of plywood and backer board (which came out PERFECTLY level), and even dry fit the sink. Christmas morning we took a little time off to open gifts. We started cutting tile, then joined friends for Christmas dinner. We spent Sunday and Monday cutting and dry setting tile. John quickly mastered the saw. 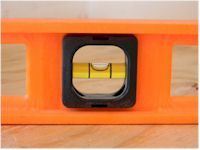 I managed to master measuring the necessary cut work. By Tuesday we were ready to mastic the tile down. A little time was spent reviewing our layout to make sure identical tiles didn't end up adjacent to each other, then we meticulously numbered tiles and stacked them neatly for final positioning. I smeared goop on and we smooshed tile into place. We even did a little custom improvised mosaic work around the stove and sink, that to this day is our favorite part of the design. Wednesday (12/29), we got a call from Lowes asking to deliver the refrigerator that day. We had originally planned to run down to the court house to get married, but decided to wait for the refrigerator. The wedding could wait till Thursday. We glued down the remaining tiles while we waited. Thursday (12/30) we ran down to the court house and got our marriage license, ran home and grouted the left half of the counter, got married, celebrated over lunch with our witnesses, then grouted the right half of the counter. We are, if anything, efficient people. 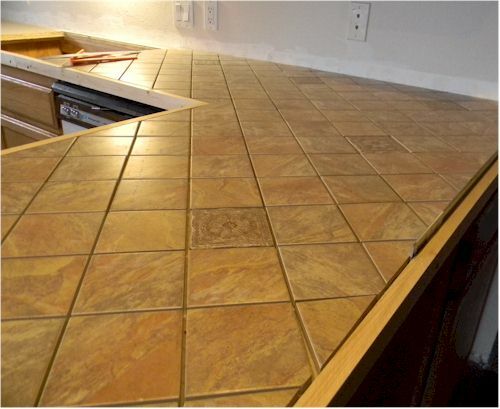 Friday (12/31) we cleaned the tile and grout. We shopped all over for trim and finally settled on some. The trim has been the most frustrating part. We had to rent a saw to do the miter cuts. It went well enough, but we simply aren't happy with the material we chose and will at some point be replacing it. Saturday (1/1) life was beginning to return to normal. John was set to connect the plumbing while I did a little computer work. After a little bit of banging, things got too quiet in the kitchen and I left the computer to investigate. I found John on the floor in front of the sink, surrounded by miscellaneous parts and pipes looking ... bewildered. Not his fault at all - the plumbing under the sink was never right. A couple of quick photos and a trip down to Lowes to review the issue with Josh, and I had a working sink. Sunday (1/2), John and I slaved to finalize the project. We cleaned every inch of the kitchen. John mopped the floors twice. 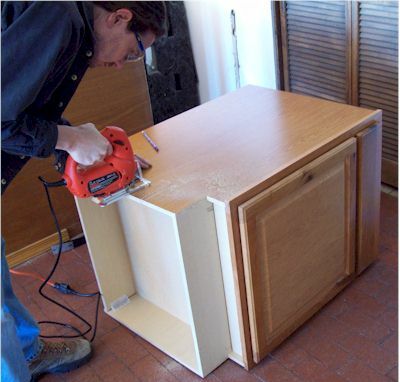 I treated all the cabinet surfaces with oil. We dusted and vacuumed the entire house. We reorganized cabinents and washed EVERY dish, pot, pan, utensil... everything. And it was worth every second. Our kitchen is glorious! We are both very proud of how this project came out. What!!! No picture of the new refrigerator....? 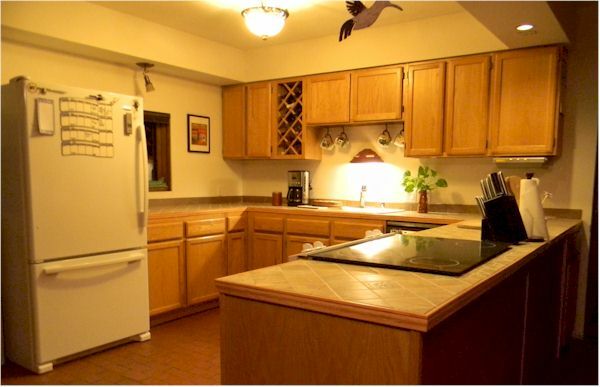 Of course there's a picture of the frig!